I won't need a flyer to get me to go again though, because whilst the Hatter may be Mad, his tea shop is lovely. The flyer also promised "a little slice of homemade loveliness, wrapped up vintage style" and that's a pretty good summation of the place. Little it certainly is - accessed through a clothes shop called Diva (or, if you're on a bike, in a wheelchair or pushing a pram via a brightly-painted pink gate in the adjacent side-street), the Tea Shop itself ia a bit of a squeeze. Lucky then that there is plenty of space in the Courtyard Garden. 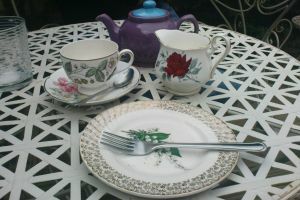 The vintage style is exemplified by the crockery used - as shown in the picture, it really is a bit of a mish-mash, but all the better for it. Crucially, you get a proper cup and saucer, milk in a proper jug and a pot that may well be served "for one" but had enough in it for three cups and change. There's a reasonable selection of teas on offer too, backed up by a decent range of savouries and cakes, many of which (the flyer informed me) are locally sourced. I had a piece of orange cake with my tea and, again, as you can tell from the picture, not a crumb was left. If all the food is that good, they won't go too far wrong. And then there are the little extra touches that make an establishment stand out. Firstly, it seems like the sort of place that is convivial to striking up conversations. As I was settling up another customer, completely out of the blue, called out to ask me how to spell Ruislip. She didn't know me from Adam, but it didn't matter. Secondly, the Tea Shop sells tea-related gifts: tea-pots, mugs, little tea trays and the like. And they're quality items - no chintzy rubbish here. And finally, there's the service: maybe I just got lucky but the young waitress who served me could not have been more charming and that, as I've said before, makes such a difference.